The other day I went to my local drug store to buy a few things. Nothing out of the ordinary or interesting—band-aids, aspirin, stuff like that. The store was really empty, which I first attributed to the odd time (the joy of working for yourself), but soon I realized there was a very different reason. So I picked up a few items and continued up the aisles. On my list was disposable razors, but for some odd reason, in order to get a package off the wall, shoppers were instructed to ask store personnel for help. I walked on and noticed that many things were either behind locked glass cabinets or tethered in such a way that only someone authorized to do so could remove them. Mind, these were not items one would associate with any need to be locked up—deodorant behind locked doors? It was, as I said, odd, and not a little annoying. The store made it so difficult for me to buy anything that, in point of fact, I didn’t. I returned to the shelves the few items that I had wanted that weren’t under lock and key and left. The store’s emptiness, I now opined, was not due to the hour but rather because it was too hard to do what a customer would have been in the store to do. Nonprofits are sometimes like that store—making it too difficult for a prospect become a donor by what should be the simple act of making a charitable gift. The first and most insidious way we make things difficult is by simply not asking. I’ve always been flummoxed (I love that word) by nonprofit professionals (and, yes, Board members) reluctance to give others the opportunity to be a part of their fabulous organization. And what better way to be a part than to ensure financial viability? Not asking is one problem. Another is not asking for the right thing or in the right way. For example, while I know there are people who respond to a direct mail appeal with pretty large gifts, for the most part, is an impersonal letter the best way to cultivate a major donor? If someone sends five or ten thousand dollars in response to an appeal, imagine what you might get from a personal visit. And think how that will make the donor feel so much more a part of your organization. Of course, there are those who like to give via mail—and if they tell you that, great. Otherwise, make it easier for them to know that their philanthropic goals are being met. That last point speaks to not asking for the right thing. We are so often focused on what we want and what we need that we forget that, really, it isn’t about us. It is always about our donors. I love how Kevin Johnson in his book, The Power of Legacy and Planned Gifts, puts it (page 159): “…shift from how to get a gift to helping donors realize their dreams.” Great advice. Above all, make it easy for your donors to love you. For them to love you, they have to know you, and they have to feel a personal connection. The best way to do that is to let them see how their gift has made an impact. And when they see what their gift has accomplished—and how it helped them to meet their dreams—you will have made it easy for them to make another gift. 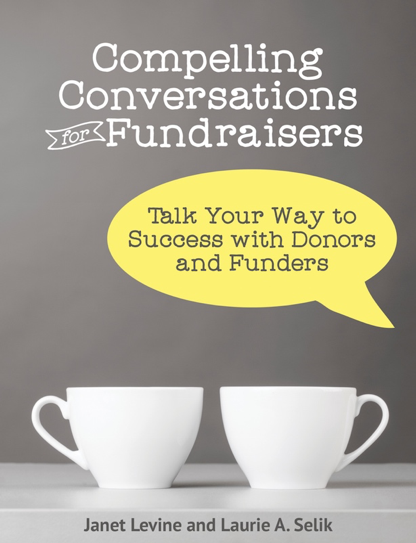 Need help in making your fundraising easy? Check out the website, http://janetlevineconsulting.com or contact me at janet@janetlevineconsulting.com and learn how easy it can be! This entry was posted in cultivation, development, fundraising, relationships and tagged easy fundraising, fundraising. Bookmark the permalink. Nice article. I agree with you on the point that we need to ask for charitable gifts at the right time in a right way. Not asking does not help at all in fundraising. By asking we give people an opportunity that they look forward to in most cases. Usually, people are generous and wanting to give.